Nutria are by far the most commonly seen of the aquatic rodents at Ridgefield, with muskrats being relatively common, beavers not common at all. There are enough clues in this picture to identify which of these rodents this is. The tail is the most obvious indicator, but the rear foot all by itself holds enough clues. A muskrat has white claws while those of a nutria and beaver are dark. 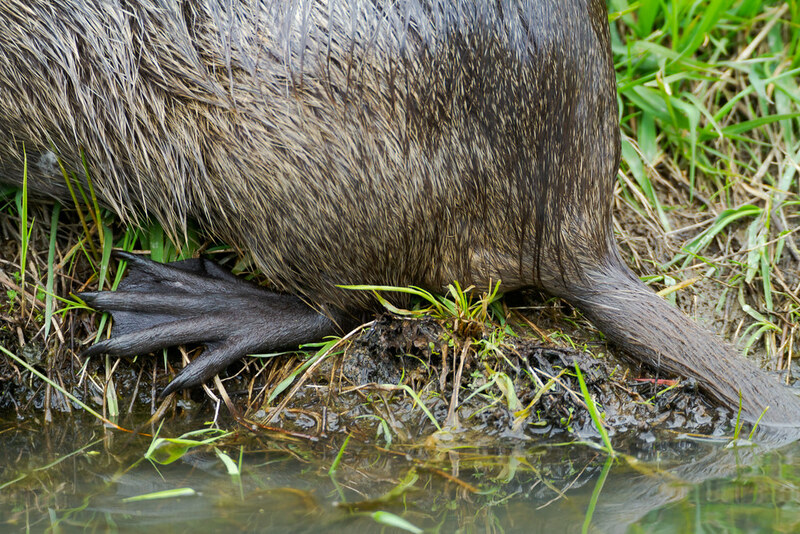 Both beavers and nutria have heavily webbed rear feet, but all five of the beaver’s toes are webbed, on a nutria only the inner four. I don’t know the answer but I do know this is a nutria. This entry was posted in Mammals and tagged auto tour, nutria, Rest Lake, Ridgefield National Wildlife Refuge, River S Unit, Washington. Bookmark the permalink.